This article aims to give you some advices to help you prepare your travel to South Korea!! Indeed, Soo-Yun, Yami no tenshi and I went to South Korea in August 2010 for the first time. It was a real cultural change. We didn’t speak Korean at all (well, we had some vocabulary thanks to dramas and we’ve started learning Korean two months before going there) and we didn’t know many people there (we had 4 penpals). Maybe it seems to be useless, but learning Korean alphabet (hangeul - 한글) enables you to read signs and that is really useful when you are lost and you want to know where you are. It is also useful when you want to show a taxi where you want him/her to leave you. If you can read a sign, then he/she can understand quite easily! I advise you to learn words such as “straight ahead” (jik jin - 직진), “on the left” (oen jjog - 왼쪽), “on the right” (oreun jjog - 오른쪽)… These words could be useful if you’ve lost your way and you ask some help to people who don’t speak English at all! Well, it could be very useful to start learning Korean! The T-money card is a pre-paid card and the card price is only ￦2,500 (~$2,3)! You can buy it in nearly all convenience stores and subway ticket booths. To recharge it, you can go to any convenience store or vendor kiosk on a street with a T-money sticker on the showcase. This card offers you many discounts. We also saw the T-money logo in Jeju’s buses but we didn’t try to use it. 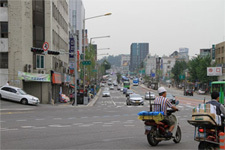 In South Korea, have in mind that taxis exist! If you are not alone, you shouldn’t hesitate to take the taxi! Sometimes, it is really cheaper than buses. The fare system is based on both distance and time. Fares begin at ￦2,400 (~$2,2) for the first 2 kilometers and go up incrementally ￦100 (~$0,09) every 144 meters beyond that. If the taxi is going less than 15 kilometers per hour, an additional charge of ￦100 (~$0,09) per 35 seconds is added to the fare. Fares increase 20 percent between midnight and 4 a.m.
On this site, there is a lot of information. Thanks to this site, you can order free brochures and they will be sent to you from the nearest KTO branch office by mail within 20 to 30 working days. To get them, register to KTO’s site, fill out the request form on this page, select the brochures you would like to have and wait for some days! The map of Korea for tourist is very useful. Plan your Seoul subway’s route to be sure not to waste time and money! If you know where you want to go, the best way to tell you the quickest way to travel, where to transfer, and fare information is to go to this page. All you have to do is click on your point of origin and your desired destination. This site is very useful if you want to know at what time you should leave not to arrive too early or too late somewhere. To finish, if you have some questions, feel free to contact us!